Now that it’s almost officially fall I can put out my decorations and enjoy the beautiful fall colors – the pumpkins, the leaves, the scarecrows. I love it! And because we live in farming country now, we’re always passing tractors on the road as the farmers bring in the harvest. Fields tall with corn are now just fields of dirty and broken stalks. To celebrate the farming heartland of America, I put together a fun booklist to enjoy with my little ones. 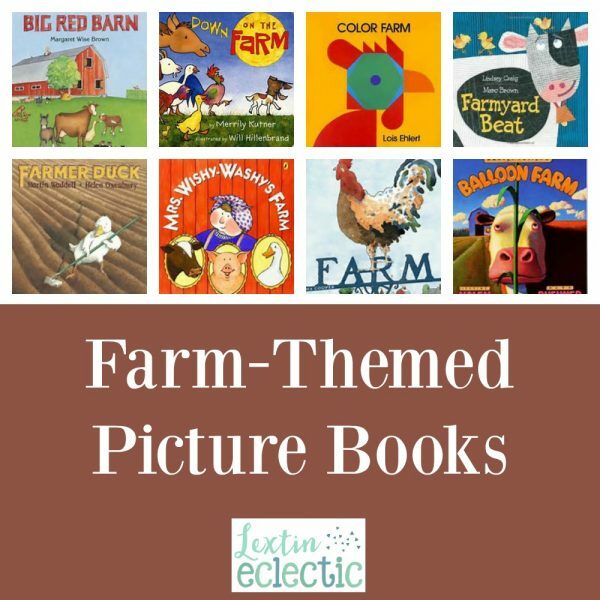 Here are some of our favorite farm-themed books! Uh-oh. Mrs. Wishy-Washy is at it again. Rubbing and scrubbing all the animals on the farm. But this time they aren’t standing for it. This beautiful and informative book paints a fascinating picture of what winter means to the farm year and to the family that shares its seasons, from spring’s new growth, summer’s heat, and fall’s bounty to winter’s well-earned rest. Do you know what it takes to run a farm? Find out what work is required throughout the year. Read about the cycle of a day on a farm, where a family of animals peacefully plays and sleeps in this classic book. Farmer Duck isn’t your average duck. This duck cooks and cleans, tends the fields, and cares for the other animals on the farm—all because the owner of the farm is too lazy to do these things himself. Animal ears and whiskers too. Shapes and colors ail around. There is so much to look at and learn about on a farm – animals, tractors, crops, and barns. And children feeding animals for morning chores! In January, the cows stay in the barnyard, and the chickens don’t lay many eggs. By March, you can tell spring is coming: the barn is filled with baby animals. Month by month, the animals at Maple Hill Farm sense the changing seasons and respond to the changes. The timeless song is brought to life with new illustrations for a new generation of readers. Harvey Potter was a very strange fellow indeed. He was a farmer but not like any farmer you’ve ever met. He didn’t grow corn, okra, or tomatoes. Harvey Potter grew balloons. The sights and sounds of noisy farmyard animals during a busy day include roosters calling, horses neighing, cows mooing, ducks quacking, and pigs oinking. Each action propels the next, from a farmer kissing his wife, who then pats the dog, to a cat, a mouse, geese, and a donkey in this beautifully illustrated picture book.